The Chronicle of Philanthropy just released a study based on IRS data showing, county by county, charitable giving in 2012. One of the interesting conclusions it saw was that the top 17 counties in terms of generosity (by % of income) voted for Romney in the last election, and not all of them were ‘rich’ counties. 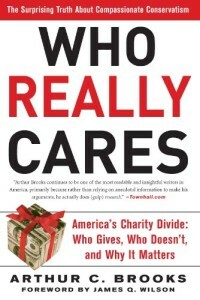 But this should not surprise us, especially after the thorough analysis of Brooks’ 2007 book Who Really Cares: The Surprising Truth About Compassionate Conservatism — America’s Charity Divide–Who Gives, Who Doesn’t, and Why it Matters. It’s the WHY that is important, not the gloating over why we Conservatives are more generous. I don’t think that we are by nature smarter or more generous, or that we care more – I’m sure that libs are generally as avaricious and concerned as we are. But what makes the difference is the power, and rightness, of ideas, and what kind of results they produce, both in individual character and public well-being. In this case, we are merely arguing that Conservatism leads to greater individual character as measured by generosity (and there could be many other measures, including divorce rates, teen pregnancy rates, drug and alcohol use, etc., so let’s not get on our high horse yet). So, what in Conservative v. Liberal ideology might lead Conservatives to be more generous? If you inhabit a sub-culture that emphasizes generosity, both the social pressure, as well as the development of habits and attitudes of generosity will grow in comparison to those outside of that culture. Of course, if you are cynical about this like Sam Harris, you think people are just giving under compulsion and manipulation, and in many places that is true. But if you are less cynical, you will see that many give out of kindness, not obligation. Liberals are so eager to fix society’s problems that they are willing to grab the reigns of government and force others to do it without their consent (socialism). They are also so sure of their priorities that they are willing to tax others to make them come to pass, putting liberty out the window. Additionally, this plays into selfish human nature – if I am forced to give through taxes, I feel like I am doing my duty without having to give more. In addition, if I try to avoid taxes through legal means, I am not really cheating social programs, I can reason it away as taking it away from the military budget or something else I don’t like. Not only that, if I feel ‘we’ ought to do more good, instead of giving more directly, I can feel good about myself by pushing for more taxes. Conservatives teach that if you are poor, you have to work hard, do good, and even in your poverty, be generous to others and it will be done so to you, even if all you have is the ‘widow’s mite.’ Liberals create a culture in which the poor should expect help, and that taxpayers (especially the rich) are the ones who should be generous. No one, they are told, expects the poor (or lower middle class) to be generous. Liberals, of course, will give lip service to giving a ‘hand up rather than a hand up,’ but their public policy and desire to get re-elected cause them to err so much on the side of hand outs that nobody really hears them, much less believes them, when they agree that people need to work hard and be honest and faithful to their spouses too.